In any city, there are our favorite restaurants. The ones we keep going back to until finally, we’re in a culinary rut. Blue Tractor BBQ and Brewery pulled me out of that rut with a new take on BBQ and beer. 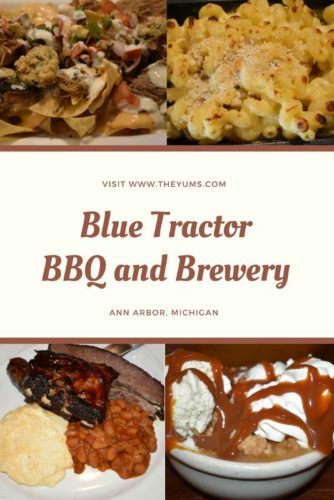 Location: Blue Tractor BBQ and Brewery located at 207 East Washington in Ann Arbor, Michigan. Menu: This world-influenced menu specializes in barbecue and beer. Blue Tractor smokes all of their meats low and slow in-house for 14 to 18 hours with Applewood and hickory. It highlights the southern United States with grits and collard greens. You’ll find representation from the rest of the globe too. Visit Cuba with the Bar-Be-Cue-Ban, a riff on the Cuban sandwich, or get a taste of Korea with the Bulgogi Burger. While BBQ is typically a carnivore option, vegetarians will also find a hearty meal at Blue Tractor. The triple mac and cheese with smoked cheddar, gouda, Wisconsin-aged cheddar topped with a toasted breadcrumb crust made a flavorful vegetarian option. With so many meat options on the menu, it readily adapts to a gluten-free diet. Thoughts: Butcher-shop style murals, decorate the walls of reclaimed barn wood decorated. The ceilings have exposed industrial fittings painted black along with painted concrete floors. The servers dress in jeans and Blue Tractor logo T-shirts. All of this contributes to the restaurant’s casual atmosphere. Live music Tuesday through Saturday adds to the fun. Check their website for their music schedule. The cellar-brewed beer served cold and fresh is the perfect accompaniment to the BBQ. On tap daily, you’ll find a selection of six beers. Try the award-winning Bearded Pig Cream Ale. It won the World Championship medal in 2010. The light-bodied beer is slightly sweet and malty. The finish is dry, clean, and refreshing. I also enjoyed the full-bodied dark ale named the Pitmaster Porter. Its notes of chocolate malt and roasted barley were a great accompaniment to the balsamic baked beans. The beef brisket quesadilla with melted cheddar, sweet corn relish, Pico de Gallo, and pickled jalapenos, topped with chipotle cream. The condiment is a sweet and spicy BBQ sauce. The Michigan Maple salad features a combination of mixed fresh greens. What makes it Michigan is not only the maple syrup in the vinaigrette but also the dried cherries. Michigan is the number one producer of tart cherries in the United States according to the Agricultural Marketing Resource Center. Add red onion, tangy goat cheese and some toasted almonds for a crunch, and you have a Michigan dish. The house-made chorizo is something special. Offered on the daily special chalkboard, the casing was seared and crispy, while the inside was juicy with a hint of spice. The Honey Cracklin’ chicken, a brown and crispy half chicken, smoked with a honey coriander glaze. Then Blue Tractor serves the chicken with sharp cheddar grits and collard greens, but the servers readily agree to swap sides to those of your preference. The balsamic baked beans, made with brown sugar, white balsamic vinegar, red and green bell peppers are a hearty side dish. Price Range: Appetizers range from $5 for smoked chicken tortilla soup to $10 for a beef brisket quesadilla or smoked wings. Salads range from $5 for a small mixed green salad to $12 for La Pollotilla, a fresh spinach salad with chicken. Burgers run from $9 to $12. Entrees run from $11 for the triple mac and cheese to $19 for a three meat combination plate with two sides. Sweets range from $6 for pecan pie or fruit cobbler to $7 for the cookie bar. Lunch for two runs about $35 including tax and gratuity. For Pinterest: Pin this to your favorite BBQ restaurant board.